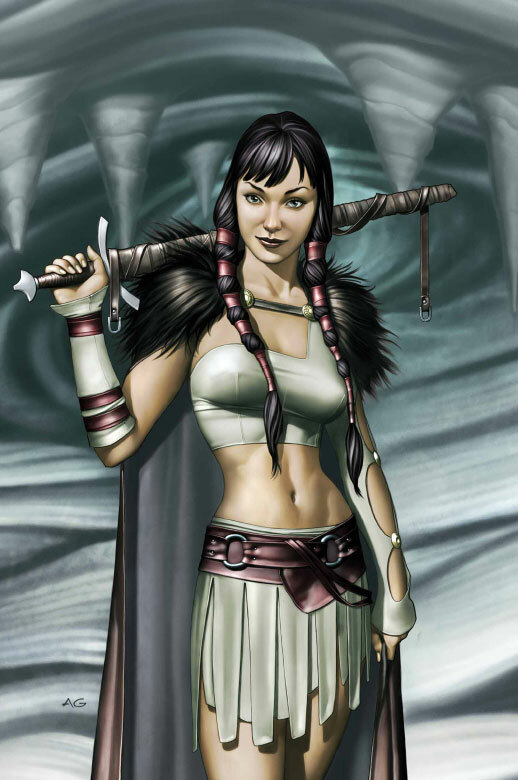 Sif is a Marvel character based off the mythological Norse goddess Sif. Sif is the sister of Asgard's guardian Heimdall. The primary Asir/Asgardian hero in the Marvel universe is Thor, who is Sif's friend and sometimes lover. She is generally depicted as a powerful Asgard warrior. Sif played by Jaime Alexander has appeared in the MCU in various places including Thor, Thor 2, and in two episodes of Agents of SHIELD. It was initially speculated that Sif would not appear in Thor: Ragnarok in part due to that film veering into a different direction and in part due to actress Jaime Alexander's busy schedule filming the the TV series Blindspot. Jaime began hinting on the possibility of Sif appearing in the film though on her social media. The Warriors Three characters are also in a similar spot but many expect to see them even though their appearances have not been confirmed. Sif is born of the nine mothers (At least true in mythology) and is the sister of Heimdall. Like Heimdall she is strong and martial. As a child she is the companion of Thor and Balder. She develops a strong attraction to Thor. She was born with golden hair but Loki at one point cut it off. Her hair was replaced by black hair made by dwarves. Her relationship with Thor was strengthened even further when a giant gave Sif to the goddess of death, Hela. Thor went down to Hel himself and offered himself in Sif's place. Impressed at the bravery of Thor, Hela released both of them. For many years Sif and Thor are lovers. When Thor is sent to Earth he develops a relationship with the human Jane Foster. During this time her relationship with Thor ends. However, Odin later makes Thor forget about Jane Foster and their relationship resumes. She has numerous adventure battling the likes of: The Unkown, Loki, Ulik, Enchanters Three, Circus of Crime, Wrecker, Mangog, Pluto, and Surtur. 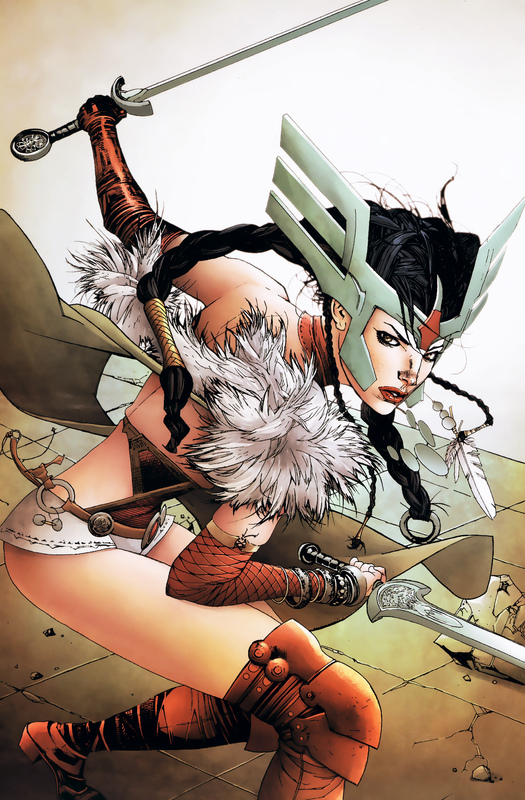 She joins the Warriors Three to battle against the rulership of Loki. Hogun attacks Loki but is thrown back. Sif throws herself before Hogun and dares Loki to kill her. Loki unwilling to kill an Asgardian relents. Sif finds Thor at the bedside of a critically injured Thor. Rather than act jealously Sif merges her own life force with Jane saving Thor's other love. Sif also hopes that through this act she can better understand Thor's attraction to humans. Sif becomes attracted to the alien warrior Beta Ray Bill. She insists the relationship is platonic to Balder but the two have many adventures together. Generally, Sif becomes highly impressed and attracted to anyone who can lift the hammer Mjolnir. She tends to be highly dismissive of almost all other men. When Thor gains control of the Odin Force he begins to remake the world in his own image. This supposed paradise turns into a nightmare. Sif resists and fights against Thor and finds herself banished from Thor. She helps Thor's son Magni stand against Thor and eventually convinces Thor to go back in time and stop him from pursing these actions. In Ragnarok she fights long and hard. She picks up the sword of the fallen Brunnhilde and leads Asgard's resistance. At one point she loses an arm but continues to fight. Eventually all of Asgard succumbs to the forces against them. When Thor seeks out the reborn Asgardians, Loki hides the essence of Sif in a dieing woman. During this time Loki uses Sif's body as his own. Thor manages to find and save her before she is lost forever. After this she rejoins Thor and the other Asgardians in the new Asgard. She defends Asgard in the event of Siege and against the forces of the Serpent. The only female warrior on Asgard that can match Sif is the Valkerie Brunnhilde. Powers of an Asgardian - Super strength, durability, longevity and speed. Many years (lifetimes) of martial experience and training. Sif played by Jaime Alexander has appeared in the MCU in various places including Thor, Thor 2, and in two episodes of Agents of SHIELD. Sif mostly appeared with the Warriors Three as one of Thor's adventuring buddies. The group had notable moments in Thor 1 when they battled Frost Giants in the beginning and later the Destroyer in the film's Climax. The Warriors Three and Sif had less appearances in Thor: The Dark World with group appearing in the beginning during a battle to create order in the nine realms. It was initially speculated that Sif would not appear in Thor: Ragnarok in part due to that film veering into a different direction and in part due to actress Jaime Alexander's busy schedule filming the the TV series Blindspot. In the end Sif did not appear in Thor Ragnarok. The Lady Sif is played by Actress Jaime Alexander also notable for her role on the TV series Blindspot.